Silk has been the fabric that epitomizes elegance and grace. It has been a part of female wardrobe since time immemorial. The demand for the fabric never goes down and that is why Shopping.rediff.com brings the best designer Cotton Sarees, Chiffon sarees and Silk saree collection! You will be spoilt for choices with our wide assortment of options; what's more? We also come with great facilities like cash on delivery for a hassle free purchase. Printed: Printed silk sarees come in gamut of designs and prints. These work best for all occasions. One can adorn them at workplace, during a family gathering etc.Shopping.rediff.com has carefully selected some exquisite designs like Bhagalpuri printed silk, Malgudi art silk Tussar Art silk for our lovely ladies who want to be style icons!Tip : One can go for a fish tail type style of draping for such sarees. To look slim one can go for small prints, vertical patterns. Zari bordered and Embroidered Sarees: Silk sarees with zari border and delicate embroidery have always been a preferred choice of women for wedding ceremonies, festival dressing and other similar occasions. These sarees are highly ornate and decorated with metal threads. So if you want to feel like a diva, grab a Zari bordered and embroidered silk saree and see the heads rolling in awe. Tip: You can experiment with your look taking inspiration from the yester years queen of Bollywood, Rekha. She looks stunning in a silk drape which she often accessories with heavy jewellery and a big pouch to complete her attire. 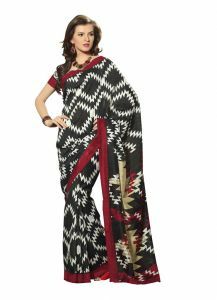 Multi-colour Silk Saree: Shopping.rediff.com has come with this great offer to make your attire colourful this festive season. Avail great discounts upto 52% on the silk drape and add poise and charisma to your appearance. The colourful prints will give a flamboyant and modern look and make you stand out in the crowd. Tip: Multi-coloured silk sarees with right kind of jewellery make one look lively. Such sarees can be worn by young ladies for their college farewells and fresher's party!At shopping.rediff.com you will find wide selection of silk sarees. Do not forget to take a glimpse of our jewellery catalogue. You might find an aesthetic neckpiece that will match with your silk drape!